Sizes 5-7 and 8-10. Free to click and collect. I know there's usually a 'book' day in some schools where the kids have to be a character from a book so this could be ok for that. Hate spending loads on an outfit they only wear for one day! Win great victories, rescue princesses or ride to liberate teddy from the evil clutches of the family dog. 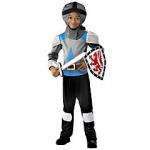 This Knight costume comprises trousers with a fabric top and hat in simulated chain-mail. There's also a foam shield that can be worn on the arm, and a sword that's ideal for slaying dragons.